In Lost Gods, Brom, the artist and author of The Child Thief and Krampus, brings readers into a dark, fantastical, masterful mix of brilliant illustrations and dazzling prose. 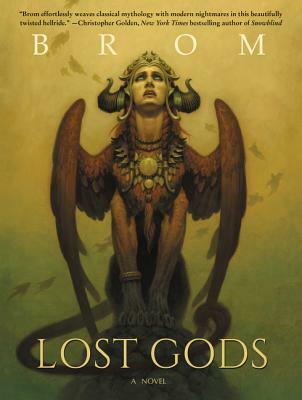 With Lost Gods, Brom’s gritty and visceral writing takes us on a haunting, harrowing journey into the depths of the underworld. Thrust into a realm of madness and chaos, where ancient gods and demons battle over the dead, and where cabals of souls conspire to overthrow their masters, Chet plays a dangerous game, risking eternal damnation to save his family.